The best way to get to know a community is by scheduling a tour. 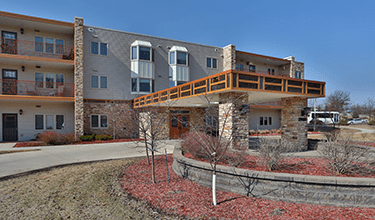 See the facilities, meet the staff and residents, and get a feel first hand what it's like to live at Prairie Hills at Cedar Rapids Assisted Living. With a cozy country atmosphere, Prairie Hills at Cedar Rapids, Iowa provides assisted living at its best. With an array of amenities, support services and entertainment, we offer a wonderful home to spend your senior years. Prairie Hills at Cedar Rapids is proud to be a Provision Living senior community. Since 2005 we have lived out our mission of providing best-in-class senior living every day by adhering to the highest standards of service excellence. Residents at Prairie Hills at Cedar Rapids are happy to call our community home. When you join our community you can choose from a variety of private and semi-private apartment homes, each complete with a private bathroom and safety features. Common areas at our communities include cozy libraries, stocked with classics and best sellers, fireplace lounges, a beauty salon and barber, verdant courtyards with gardening areas and entertainment rooms. On any given day residents can be found enjoying activities such as card and book clubs, art and crafts or fun excursions and day trips. Now that there's no need to handle the preparation and cleanup, meals are an especially festive where residents can be found connecting and socializing in our gracious dining room. Prairie Hills at Cedar Rapids invites you to consider the benefits of life without the chore of home maintenance or housekeeping. Residents say that when we take care of the basics such as tidying, emptying the trash and changing bed linens, life has never been better. While we enable your freedom to enjoy life as you choose, we are also there to assure safety and comfort, providing support when you need it. Our caring staff is on hand to assist with tasks such as appointment scheduling, medication management and other activities of daily living such as dressing and bathing. For those with memory impairment associated with Alzheimer's or dementia, many of our communities can provide the compassionate support, guidance and security that your loved one needs. Come on down to Prairie Hills at Cedar Rapids and see how our gracious community can be the home that brightens your horizons.